In Florida the bicycle is legally defined as a vehicle and the bicyclist is a driver. 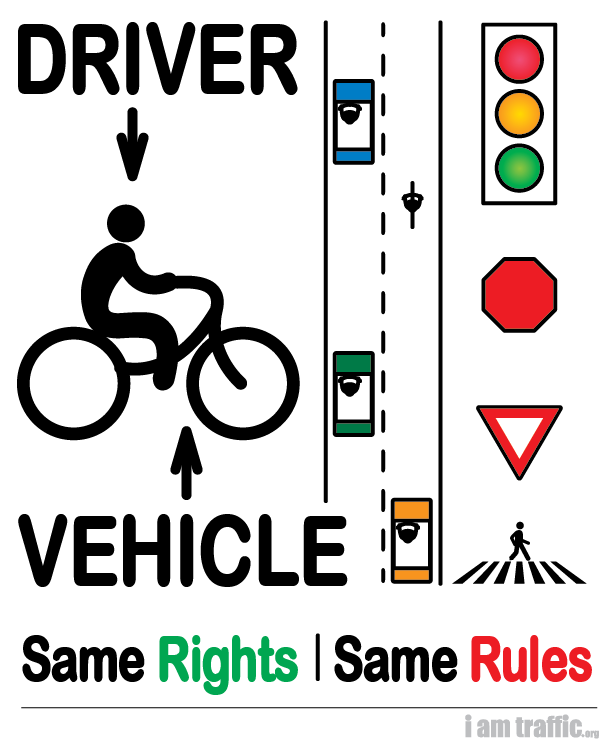 Bicyclists have the same rights to the roadways, and must obey the same traffic laws as the drivers of other vehicles. These laws include stopping for stop signs and red lights, riding with the flow of traffic, using lights at night, yielding the right-of-way when entering a roadway and yielding to pedestrians in crosswalks. There is only one road and it is up to bicyclists and motorists to treat each other with care and respect. Adherence to the law is the foundation for this respect, but the law itself is simply a codification of the rules of movement that make all road users predictable to one another. To learn more about safe, predictable bicycling, see our Info for Bicyclists and Info for Group Riding pages. To learn more about the how motorists can safely share the road with bicyclists, see our Info for Motorists page. A key 2012 amendment in the regulations allows bicycle lights to flash. Obtaining and maintaining pricey bicycle lights that required frequent recharging or replacement of batteries was once a nontrivial challenge for evening riders, providing a perennial theme of discussion and review in cycling magazines and online forums. Now, with compact, relatively moderately priced LED lights that can run for many hours on a charge (especially on flash or low-power settings), cyclists who ride with lights at night (as legally required) are cooking with gas, so to speak. As of 2012, Bicyclists are no longer required to keep at least one hand on the handlebars. As of 2011, the lane position and bike lane law include an exception for avoiding a potentially unsafe condition. This is significant in that it allows bicyclists to anticipate dynamic conditions which have the potential to make a bike lane or far right lane position unsafe. New (2012) editions of the Florida Bicycle Law Enforcement Guide and Florida Bicycling Street Smarts (see FBA publications) reflect changes in traffic laws made by the 2012 Florida Legislature (and changes in the Florida long form crash report form), incorporate updated crash statistics, and clarify key guidance. The tabs to the left contain highlights and explanations of key sections of Florida law pertaining to bicycles. For the official version you can dig through the code here. A bicyclist riding on sidewalks or in crosswalks must yield the right-of-way to pedestrians and must give an audible signal before passing. A bicyclist operating on a one-way street with two or more traffic lanes may ride as close to the left-hand edge of the roadway as practicable. In addition to the normal vehicle left turn, a bicyclist may proceed through the right-most portion of the intersection and turn as close to the curb or edge as possible at the far side. After complying with any official traffic control device, the bicyclist may proceed in the new direction. A signal of intention to turn must be given during the last 100 feet traveled by the vehicle before turning. If a bicyclist needs both hands for control, the signal need not be given continuously. A bicyclist may not wear a headset, headphone, or other listening device other than a hearing aid when riding. Wearing a headset blocks out important audio clues needed to detect the presence of other traffic. The local governments of counties, cities, towns, and other municipalities can adopt ordinances regulating bicycle riding. Some towns may also have registration and licensing ordinances. Sidewalk riding may be prohibited entirely or only in certain areas such as business districts. Local law enforcement agencies can provide copies of local ordinances. [§316.091] No person shall operate a bicycle on a limited access facility, except as otherwise provided. No person shall operate a bicycle on an interstate highway. Comment: At this time, the only exception provided is for the Jacksonville Expressway System [§ 349.04(1)]. A limited access facility is “a street or highway especially designed for through traffic and over, from, or to which owners or occupants of abutting land or other persons have no right or easement, or only a limited right or easement, of access” [§316.003(19)]. 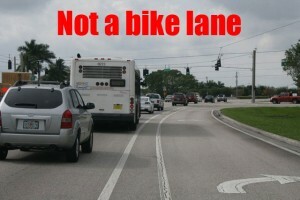 For more information or to ask questions about Florida Bicycle Laws, visit flbikelaw.org. State Law says you must ride as far to the right as practicable. It does NOT say as far to the right as possible. Practicable means capable of being done within the means and circumstances present. This is extremely important! It takes into account static and dynamic, current and downstream conditions which influence the choice of lane and position within that lane. The bicycle driver is as much a moving component in the system as any other driver. The law may not curtail the safe movement of any road user for the convenience of another. The edge of the road harbors the majority of hazards bicyclists face. Defensive driving (avoiding crashes and conflicts) requires the bicyclist to operate significantly away from the edge of the road. 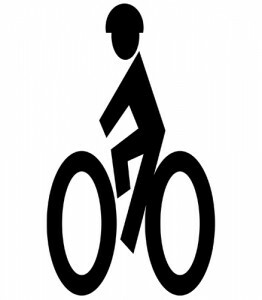 To learn more about defensive bicycling, see our Info for Bicyclists page. When a lane is too narrow for a bicycle and a car to share safely, the cyclist is entitled to the use of the entire lane. Within this lane, the cyclist usually rides on the right half to facilitate visibility for overtaking motorists, but should ride far enough left to discourage mototists from trying to squeeze past within the lane. Although the law uses the term “substandard” to describe a lane that is not wide enough to share, these narrow lane-widths make up most of our roads. The shareable-width lane, or wide curb lane, has become less common as multi-lane roads have become more prevalent. Unfortunately, the reference to substandard width not only represents an unusual situation, it conflicts with other highway design guidance. This creates a great deal of confusion for law enforcement and increases the burden of proof for the defensive-driving bicyclist. A WCL is a lane wide enough for side-by-side operation. These are typically 14-16 ft wide. The Florida Department of Transportation’s Manual of Uniform Minimum Standards recommends an outside lane width of 14 feet as the “minimum width that will allow passenger cars to safely pass bicyclists within a single lane,” i.e., without the need for passing motorists to use part of the next lane. A cyclist is defined as being 2.5 ft wide with a minimum operating space of 4 ft. This includes the minimum safe distance from the edge of useable pavement (2 ft). The legal minimum passing clearance for an overtaking vehicle is 3 ft.
A typical passenger vehicle is 5.5 ft (car) – 7 ft (SUV) wide. NOTE: The minimum does not account for commercial trucks and utility trailers which are 8.5 ft wide and can have mirrors extending to ~10 ft. Those vehicles MUST use part of another lane to pass safely. 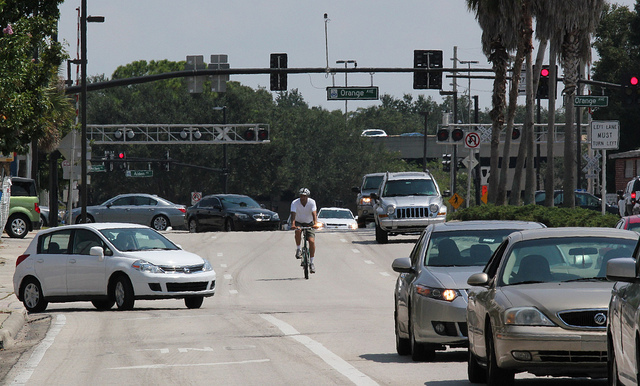 For more about lane widths and how things fit, CommuteOrlando offers a visual primer on widths and buffers. On-steet parking — A cyclist riding past parallel-parked cars should maintain a clearance of at least 5 feet to avoid risk of collision with an opening car door. 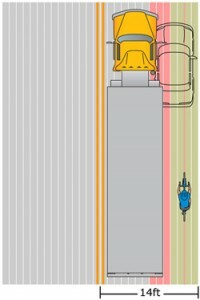 The cyclist must take into account door width, handlebar width and the “startle” clearance — a distance at which a suddenly-opened door will not cause a reactive swerve into adjacent overtaking traffic. One-way streets — A bicyclist operating on a one-way street with two or more traffic lanes may operate in the left lane. Paved shoulders — Where a curb is not present, the right-hand edge of a roadway is the line between the roadway and the shoulder (an exception is when that space to the right of the line is designated as a bike lane). Since the definition of “roadway” excludes the shoulder [§316.003], cyclists are not required to ride on paved shoulders, although they may prefer to do so. A cyclist may ride only along a right-side paved shoulder, i.e., must ride in the direction of traffic, since this is the only practical way to comply with the requirement to obey all applicable traffic signals and signs [§316.074]. A cyclist operating in the shoulder is vulnerable to common crossing collisions where many streets and driveways are present. A bicycle lane is a lane marked with a stripe and symbols for the preferential use of bicycles on a roadway (motorists may enter or cross a bicycle lane to turn into or off a roadway at intersections and driveways). 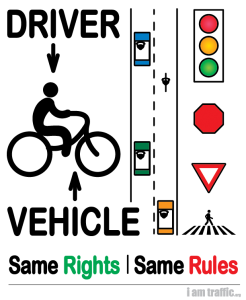 The official symbol marking used in Florida to designate a bicycle lane is shown in the figure [right] (FDOT Design Standards Index 17347 and Florida Greenbook). 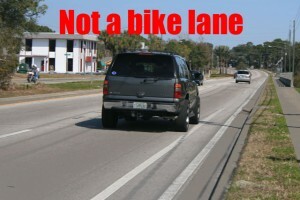 Where no bicycle lane is marked, a white edge line is often marked to indicate the edge of the roadway. On a road with curbs, the gutter is not part of the roadway. A cyclist should avoid the gutter area; pavement joints or debris may be hazardous. On a road with flush shoulders, any pavement beyond the edge line is a paved shoulder; it is not a bicycle lane unless it is marked with the bicycle lane marking. A cyclist may leave a bicycle lane for any of the purposes listed in the law — essentially to avoid any unsafe condition or potential hazard. 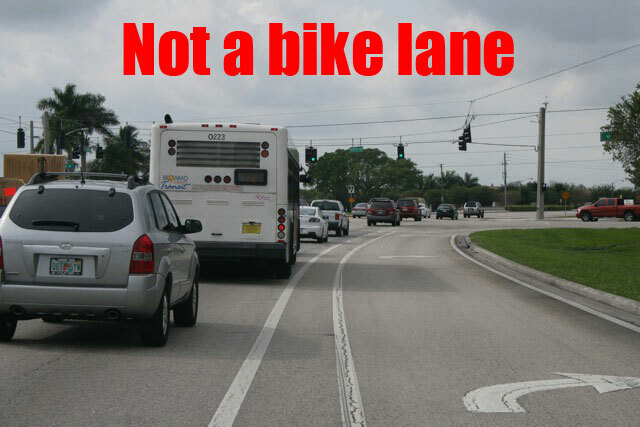 To better understand how to operate safely in bike lanes, see our Info for Bicyclists page. Bicycle lanes are typically designed for through travel. To make a right turn where a right turn lane is provided to the right of a bicycle lane, a cyclist should leave the bicycle lane, since continuing in the bike lane to the intersection and making a sharp right turn could surprise a motorist in the right turn lane. This is not a bike lane because it does not have signs or pavement markings. It is only 3ft wide, so it does not meet the minimum width requirement. Similarly, a cyclist using the roadway to make a left turn should leave the bike lane in advance of the intersection, rather than make a sharp left turn at the intersection that could surprise or cut off a motorist in a through lane. Where a bicycle lane is continued along the right side of a through/right lane, a cyclist who intends to go straight may need to adjust their position to the left to reduce the hazard of being cut off by a turning motorist (in about 10 percent of bicycle-motor vehicle crashes, through cyclists were cut off by motorists who overtook the cyclists and made right turns in front of them, or who approached from the opposite direction and made left turns in front of the cyclists). Where no bicycle lane is marked, a cyclist who intends to proceed straight through an intersection should not ride in a lane marked or signed exclusively for right turns, since all drivers are required to obey applicable traffic control devices (see “Obedience to traffic control devices” above). This is not a bike lane because it does not have signs or pavement markings. It is only 29 inches wide. The total width of this space plus the adjacent lane is less than 14ft. Roads with flush shoulders: where no bicycle lane is marked, a white edge line is typically marked to indicate the edge of the roadway; any pavement to the right of the edge line is shoulder pavement, not a bicycle lane unless it is marked with the bicycle lane symbol. Since the definition of “roadway” excludes shoulders, a cyclist is not required to ride on a paved shoulder that is not marked as a bicycle lane, although they may prefer to do so. A cyclist who rides on a paved shoulder should still travel on the right because (1) this reduces crash risk at intersections and driveways (drivers don’t expect traffic on shoulders to approach from the “wrong” direction) and (2) whenever the cyclist enters the roadway (e.g., to pass a pedestrian or other cyclist, cross an intersection, keep clear of a vehicle approaching to enter the roadway at a driveway, avoid debris or obstructions, etc. ), right-side operation becomes mandatory. Since the minimum clearance for passing a bicyclist is 3 feet (see “Overtaking and passing a vehicle” above) and the total width of larger motor vehicles (with extending mirrors) is commonly 8 feet or more, an outside traffic lane with less than 14 feet of width for travel is commonly not wide enough to accommodate passing motor traffic within the lane. Where restricted conditions prevent inclusion of bicycle lanes or paved shoulders on urban roadways, Florida Department of Transportation engineering guidance recommends an outside lane width of 14 feet to “allow passenger cars to safely pass bicyclists within a single lane,” i.e., without the need for passing motor vehicles to change lanes (Florida GreenBook, chapter 9). Though some try to claim solo bicyclists or bicyclists riding single file are unlawfully impeding traffic, they are not. The impeding law only applies to motor vehicles. It does not apply to vehicles driven by human or animal power. 316.183 (5) No person shall drive a motor vehicle at such a slow speed as to impede or block the normal and reasonable movement of traffic, except when reduced speed is necessary for safe operation or in compliance with law. Nonetheless, cyclists should pull over — at their discretion and only when it is safe to do so — if a significant line of traffic accumulates behind them. 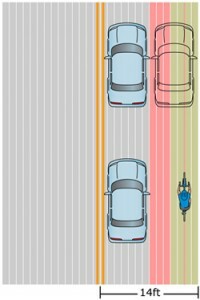 The only place “impeding traffic” appears in the bicycle law, is with regard to riding 2 abreast. 316.2065 (6) Persons riding bicycles upon a roadway may not ride more than two abreast except on paths or parts of roadways set aside for the exclusive use of bicycles. Persons riding two abreast may not impede traffic when traveling at less than the normal speed of traffic at the time and place and under the conditions then existing and shall ride within a single lane. This lane is too narrow for motorists to safely pass a cyclist. Due to the median, motorists cannot pass. It makes no difference whether cyclists are single or double. The 2-abreast rule only applies to roads on which a single rider can operate side-by-side with a motor vehicle (i.e. a lane 14 ft or wider, or a road with a bike lane). A single cyclist (or single line of cyclists) is entitled to the full use of a lane less than 14 ft wide, therefore it makes no difference in the flow of traffic for riders to be 2-abreast. In many cases it actually facilitates overtaking by reducing in half the distance needed to pass. For more about this, visit the Group Riding page. On this road, there is plenty of width for a motorist to safely pass a cyclist, or group riding single file. If the group rode double, there would not be enough space for the motorist to give adequate clearance. Riding double would impede traffic. “Impeding traffic” is not defined in the law, but reducing a motorist’s speed for a few seconds until it is safe to pass does not constitute an impediment or an obstruction.